How do you tell your customers that you’ve made a mistake and lost their data to criminals? Every day more and more companies find themselves in this predicament and rest assure that no customer will let you off the hook. How can they not? You can hardly expect them to say “thank you for telling me” or “it is not a problem” while their personal data in the hands of criminals can ruin not just their credit records but also their lives. 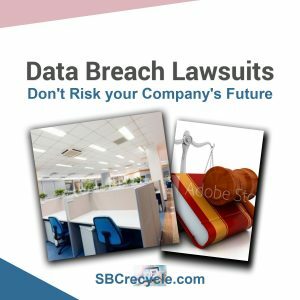 Silicon Valley Business Journal recently posted the following: “Yahoo’s holding company will pay $47 million to settle three separate lawsuits over its mishandling of the biggest data breach in human history”. Will your company survive a lawsuit like this or will you have to sell to survive? What about the trust of your customers? Will you be able to restore your credibility? “Prevention is better than Cure” Do you have the necessary safety measures in place to protect yourself and your staff? Data Breach does not only happen via the internet: What happens to your old electronics? Keeping them “safe” in a storeroom where criminals can easily break into? Hand it over to a Recycling Company who stag it in their storage place or transfer it to another country because they don’t have the infrastructure to get rid of your sensitive data securely? Make sure your Recycle Company is prepared to take full responsibility for your data and any Lawsuit that may occur so you can sleep well and know your Company is safe. SBC Recycle is more than just electronics recycling: We are a Complete Secure E-waste Solution and offer secure data destruction. Safeguarding confidential information is crucial for all companies in our current perilous and insecure digital landscape. SBC is proud to offer 100% guaranteed physical destruction of sensitive data for your company. We currently serve large Fortune 500 to small businesses. We are HIPPA compliant which is required by government agencies, healthcare organizations, financial institutions. We offer onsite and offsite data destruction. We also provide data wiping with industry standard commercial wiping software.